Google and Apple are considered by most not only as the market leaders, but the workhorses pushing the limits in terms of innovation and broadening the digital arena’s horizons. With the Big G working to bring self-driving Google Car to the masses – an endeavor that could apparently give Uber a run for its money – we now have more information on Apple’s purported electric car effort, which, as well as commanding a vast research and development team, may also embrace the idea of cars that mobilize almost completely independently of human interaction. It was back in May of last year that the world first caught wind of Google’s self-driving car, and while the search giant’s broad research team means that we regularly catch glimpses of potential game-changers, there was a real feeling that the Android maker had struck gold with this one. Very recently, we learned that Apple may be plotting to expand its automotive reach beyond CarPlay, and now Reuters is reporting that Tim Cook’s army is gearing up for a stab at the self-driving industry as well. The Big Two in the modern technology industry are credited with forging and maintaining competition on so many levels, elevating their rivalries way beyond iOS and Android. But while Glass, Apple Watch and their numerous other achievements and achievements-to-be have piqued the interest of digital consumers, a showdown in the field of self-driving cars could take this battle royale to unprecedented new heights. In many respects, Reuters’ coverage contradicts what the Wall Street Journal has been saying, given that self-driving cars were not supposed to be a part of the bargain. Whereas the WSJ sourced its info from an Apple source, publication has supposedly been in contact with well-informed automotive industry sources, and with both of these publications being well-respected and generally accurate in their aspersions, it’s hard to know which to trust. Then again, if Reuters wasn’t confident enough that its information was accurate, its report mightn’t have been published in the first place, and since it’s the more recent of the two, our instincts incline us to lean towards the notion that self-driving cars are on Apple’s radar. What do you think; could, and more to the point should Apple dip its toes into these uncharted waters? Do be sure to share your thoughts and comments with us below! and we call apple is innovating. Its again Apple. Can not think a smarter world without Apple. Interior just made me unstable. It will harder to wait until announcement. Respect. Better use a safer encryption of the car´s networks, at least allow the end user to change the root password. Nice Orwellian car you have there. No thanks if it is powered by apple maps ! 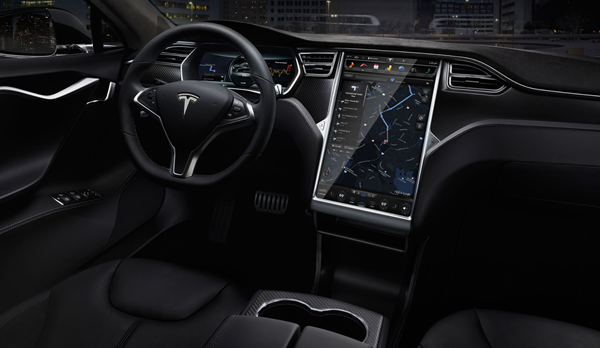 the interior is from Tesla… that’s already for sale. you don’t need to be unstable now. Where’s my Apple Flat screen? you havent jailbreak your car yet? Where’s that Patrick Gina guy who disses Apple?